from THIS PAGE at TSR. Probably many of you know the astounding Prada ReflectionFloors and the Millennium semi-transparent set by Teko (Murano). I've been asked to create a reflective wall coordinated to those floors. After all, it's the same technique I already used long ago for the Grand Trianon set: a mirror with a recolourable glass on top; but now with the option to have a half-transparent mirror, that reflects and lets you see what's behind at the same time. This incredible result has been achieved by the Millennium Shader by Teko (Murano) (downloadable separately). WARNING: using too many Full-Wall Mirrors or too many Reflection Floors (by Teko) may slow down your game. Full-wall size: the mirror's width is exactly the same as one wall section, granting seamless junctions with the adjacent modules. Three reflection modes (full/half/no reflection): while the full reflection hides completely what's behind the mirror, the half-reflection lets you peek the colour of the wall (so that you can add a reflection to any existing wallpaper). 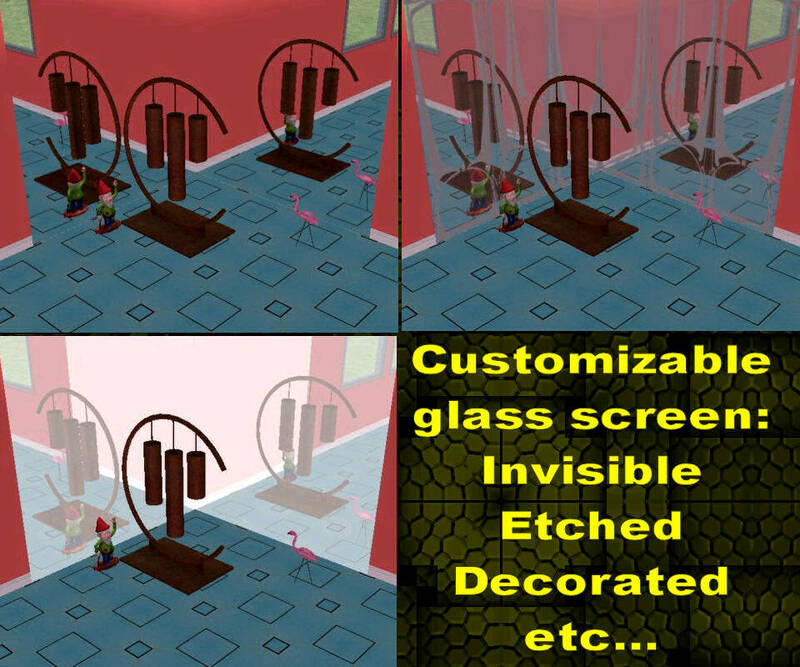 The "no reflection" is used to completely disable the reflection, leaving only the visible glass screen (for example, to add a decoration to any existing wallpaper). Recolourable/Invisible glass screen, usable to apply etchings, scratches, breakings, messages written with the lipstick, and anything your fertile mind can imagine The glass can also be used also to create recolours coordinated with Teko's ReflectionFloor, and with the many existing recolours created for it. My Full-Wall Mirror is just one piece, a single 1-tile wall mirror; Teko's set is composed by many pieces, that include different shapes for floors and walls. On the other hand, my wall mirror is recolourable, and can be decorated with etchings and other graphics; moreover, at any time you can choose to turn the reflection to full, half or off, without selling anr rebuying the mirror. IMPORTANT - PLEASE READ! Each of the following downloadable package REQUIRES an additional package to be installed. READ the requirements next to each package name! FullWallMirror_main.rar: it's the main mesh, containing the three reflection modes, the "invisible glass screen" and one glass recolour (an ornated etching from the Grand Trianon set). REQUIREMENTS: you must install the "murano_millenium_SHADER.package", that can be downloaded for free from THIS PAGE at TSR. FullWallMirror_Recolours_GrandTrianon.rar: archive containing 4 glass recolours from the Grand Trianon set (1 "optical" and 3 Art-Nouveau). REQUIREMENTS: none (you DON'T need the Grand Trianon set to use these recolours). FullWallMirror_Recolour_Teko-Prada.rar: this rar contains the recolour coordinate with the original Teko - Prada ReflectionFloor. 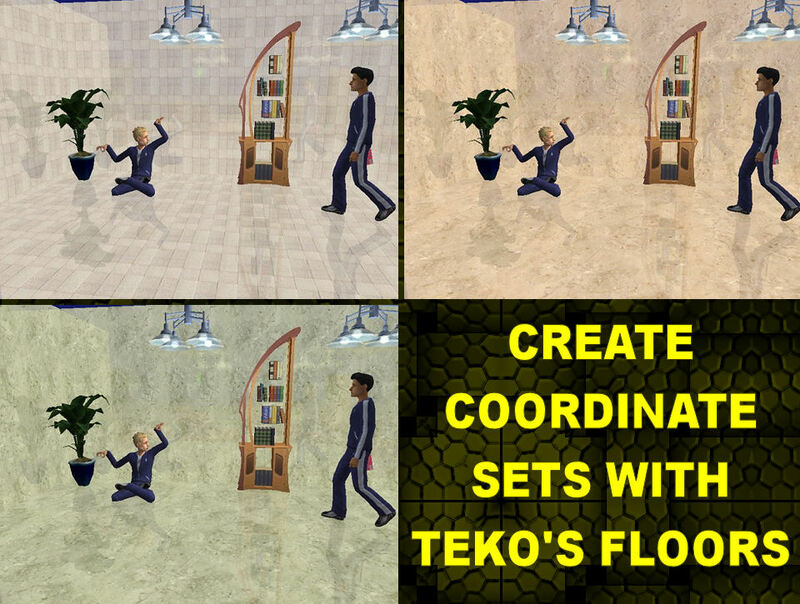 REQUIREMENTS: you must install the "teko_prada_reflectionfloor.package", found in the "teko_prada.rar" that you can download from THIS PAGE at ReflexSims. all contained in the "Lex-Teko-Pradafloor-recolors.rar" that can be downloaded from THIS PAGE at ReflexSims. You will find the reflection walls in Decorative -> Mirrors. As soon as you pick one, the default configuration is: half-reflection + invisible glass (i.e. the configuration suitable to add reflection to any wallpaper). You can select a different reflection type (full reflection or no reflection), as well a different glass (decorated, coordinated with the Prada floors etc.). The "keep buying" feature is enabled (like when you buy chairs, for example). The wall-mirrors have all the standard mirror functions; in order to get the pie menu, you have to click on the upper half of the wall-mirror (this is to prevent overlaps with the clickable area of the objects placed in front of them). - My Full-Wall Mirrors are compatible with any game configuration (from the base-game to Seasons/H&M). - The Millennium Shader, as far as I can see, it's compatible with any game up to Seasons/H&M, too. - Teko's Prada Floors currently require Nightlife, but I've prepared an all-games version that will be soon replace the one at ReflexSims. - The Murano Millennium Floor currently requires Nightlife, but Teko (Murano) is modifying it so to be compatible with any game. IMPORTANT - Though this mirror has TWO recolourable subsets ("mirror" and "glass"), only the "glass" subset should be recoloured! 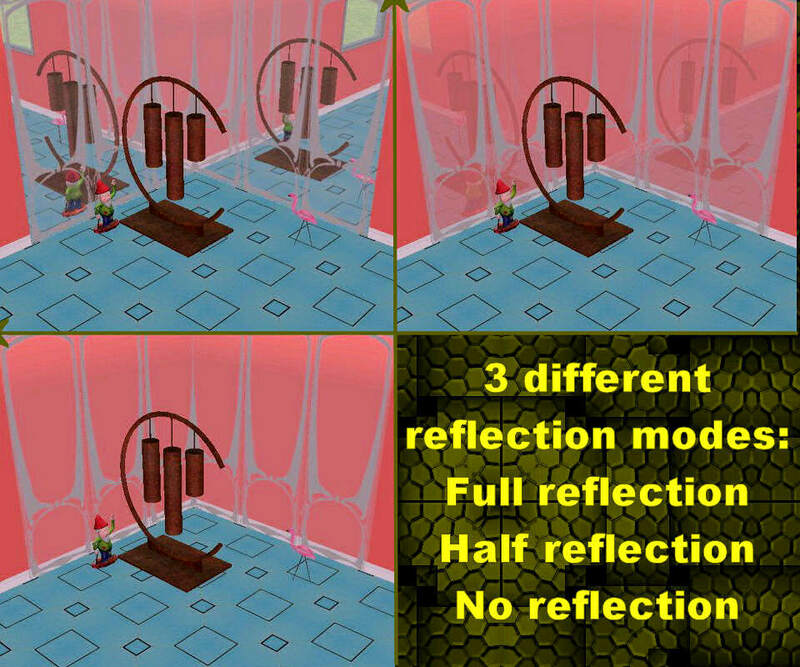 Don't even try to recolour the "mirror" subset: you can't change the reflections! All the following instructions explain how to recolour the "glass" subset. Use Object Workshop as usual. Keep in mind these important facts: a) the texture must be semi-transparent; b) only the leftmost 1/3 of texture is actually used (this was needed because Teko's floor is 3x3, while the walls are 1 tile only); therefore, if you create a 256x256 texture, only the leftmost 85x256 are actually used. Open the floor recolour with SimPE; select the Material Override and write down the content of the "Name" field. Then, using Object Workshop, create a CLONE of my "Teko-Prada" wall recolour; select the Material override (it's the only file in the package) and fill in the "Name" field the name you have written down earlier. Commit and save. This way, your wall "recolour" will actually use the original TXMT and Texture from the floor recolour, ensuring a perfect correspondance; of course, the coordinated floor recolour must be in your Downloads, or the wall recolour won't work. FAQ: ONLY ONE SIZE? NO DIAGONAL? Yes, the Full-Wall Mirror comes in only one size (1 tile); I'm NOT going to create 2-tile, 3-tile, n-tile modules. Teko has told me that he's planning to create semi-reflective walls in several different sizes, so you should check often MuranoMobilia.com for updates! As for the diagonal, I'm not sure... The best results with these walls are achieved with square-angled walls anyway. If I find the time, I could add a diagonal version in the future. Credits to Teko (Murano) for his marvellous Millennium Shader and for the original Prada Reflection Floor; thank you, Teko, for you valuable contribution to modding! Credits to Lex for the textures referenced (but not included) in the my recolours attached to this post. Credits to The Dream Team (which includes me ) for the Grand Trianon etchings. Please read my full policy in my profile. IMPORTANT - PLEASE READ! Each of the downloadable package above REQUIRES an additional package to be installed. READ the requirements next to each package name! Oh Mama! Why are you spoiling me like this? Thanks! A lot! I was waiting sooo long for this!!! These will look great in some of my labs! Wow, thanks! I can't wait to try these out! Beautiful work and great idea! Thanks for creating and sharing this. SQUEE! i requested this some time ago...well shortly after the teko floors came out! Awesome ... thank you ! I love this, but my computer isn't high-end or anything, so I'll have to pass. Waow !!! I would like a reflection wall for a long time and it's here ! BRAVO Numenor, I will use this mirror with much pleasure ! It's simply perfect ! Special thanks to all custom contents creators. Thank you very much! This is a revlolution for sure! This is amazing! I will surely be using it a lot. I thank everyone for everything that I download. I don't think I've missed anyone yet. (: If I have missed someone, my apologies. I thank you in spirit. Thank you, oh Great SimGod! #24 30th Jul 2007 at 12:04 AM Last edited by Numenor : 30th Jul 2007 at 12:11 AM. And I don't know if it's workable hum... is it possible to use the same tech as Murano mirror on walls ? Cause it it be more simple to add a transparent mirror on an old wall to get it reflective without using Lex tiles. 1) Lex' recolours - I have used in my "recolours" the same names that Lex used for his; therefore, it should be easy to find the righ packages to put in the Downloads (you could even install all of them , but they are too many, for my tastes! ). Why didn't I just included the texture in my recolours? Because I didn't get permission to, in the first place; and also because having two identical texture (and so big!) in the Downloads would have meant a useless waste of resources and longer loading times. For the same reasons I haven't included the Teko-Prada texture, and therefore you need the Teko-Prada Floor in your Downloads. P.S. : Lex' recolours are for the Teko Floor, they are not autonomous floors. Therefore you won't find them in tiles or other walls/floor. When you install the mentioned 5 packages by Lex, you will see them as recolours of the Teko floor and of my reflection walls. 2) Both Teko's floor and my walls can be found in catalog in the mirrors section. Teko's floor need Nightlife in order to work (if you don't have Nightlife, you won't see Teko's floor in catalog, but its texture will be used by my walls nevertheless). 3) Murano mirrors - I'm not sure what you are talking about. However, you can't create a "semi-transparent mirror" that lets you see the wall behind. Mirrors are always 100% reflective, and hide whatever lies behind them; you can only put something semi-transparent in front of them. EDIT - Jonesi explained me that Teko managed to create a semi-transparent mirror floor, that can be placed over any existing floor. I didn't know, and I can't check these floors by now, because Teko's site is closed for maintainance. I'll report back about this when the site is up again.